When you’ve got your period, there’s no need for it to be a huge hassle – however busy you are. As long as you’re organised and have the right sanitary towels with you when you need them, you can take menstruation in your stride. But binning sanitary towels can sometimes be an issue, especially when you’re out and about. According to Bodyform research, in fact, when it comes to feminine protection, towel disposal is a common gripe. And that makes total sense. That’s why Bodyform has created Roll.Press.Go. 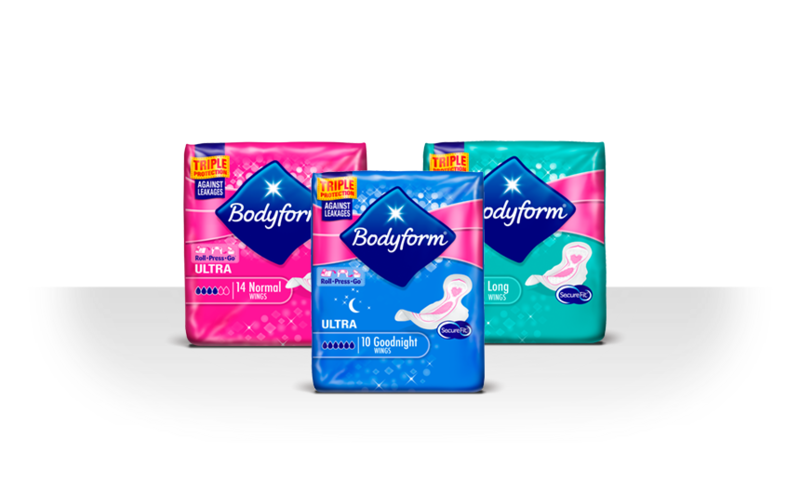 Sanitary towels that can be disposed of hygienically and discreetly, wherever you go. No bin nearby? No problem. The Roll.Press.Go wrapper has unique self-sealing edges on all sides, so you can hygienically seal your used towel inside it, then dispose of it. And because the sealed Roll.Press.Go wrapper stays tightly secured even after disposal. Before Roll.Press.Go, towel disposal often meant wrapping a used sanitary towel in reams of toilet paper, or rooting around in your handbag for a plastic bag to hide it in until you could find a bin or sanitary towel disposal unit. Both messy and inconvenient – especially if neither toilet roll nor plastic bag are available. But not anymore. Because now, whether you’re at your desk, on an airplane, jogging in the park or in a busy nightclub, all you have to do when you change your sanitary towel is roll the used one in the self-sealing wrapper, press the edges, then go. Job done. Roll.Press.Go: simple, hygienic and discreet.